What is Inventoried in the Unit? Resort Harbour Properties wants to ensure that we meet or exceed your expectations. To achieve this, we require the following standards in each of our Florida vacation rentals. To determine more specific details on the Inventoried Items, preview the description page of your Sanibel Harbour vacation rental unit. Kitchen - Service for 8 Dinnerware, Silverware, and glasses. Emergency Supplies - Fire Extinguisher, radio with battery backup, glow sticks, and hand operated can opener. Miscellaneous - Hair Dryer, iron / iron board, Starter Pack, vacuum cleaner, broom, cleaning chemicals supplies. When you arrive at one of our rentals on the beachfront the following sundries will be there to help start your vacation. They are intended to help get you started with your stay. It is up to you, if you would like any additional items. There is a Publix grocery store ½ mile down the road for some basic toiletries and supplies if you should run out. About 1 week before your arrival you will receive an Email with your Self Check-in Instructions which will include a Lock Box Code that will have a key to the front door. Once you are in the unit you will have 2 sets of keys for your use. We ask that you return the Lock Box key back to the lock box in case you find yourself locked out. What is the difference in the Unit Ratings? Resort Harbour Properties, LLC rates the condominium units on a rating system from Luxury, Deluxe and Standard. Luxury Rating - These Sanibel Harbour rental condos are approved by our most discerning guests. It is like walking into a model home completely renovated to current design fixtures, furnishings and electronics creating a gorgeous setting inside or outside to spend your getaway. 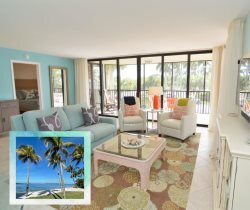 Deluxe Rating - These Sanibel Harbour beach rentals have been upgraded in recent years and offer a cohesive design theme throughout the unit that compliments the stunning sunsets outside your balcony. Standard Rating - These Sanibel Harbour vacation rentals are a great value offering the same breathtaking waterfront views without all the interior frills and upgrades. Do all condo units overlook the water? Do all properties provide beach equipment? Sanibel Harbour Condo Rentals are conveniently located next to the Sanibel Harbour Marriott Resort & Spa overlooking Sanibel Island. Take the last exit before going over the Sanibel Causeway to Sanibel and Captiva Island. The resort south end of the property overlooks the Gulf of Mexico and the West end overlooks San Carlos Bay and further to Sanibel and Captive Island. We are only 7 miles from Fort Myers Beach and 35 minutes for Southwest International Airport. The gateway to all that Fort Myers – Sanibel area has to offer! No-see-ums are insects smaller than gnats that inflict a bite resulting in small, red dots that itch; similar to mosquito bites. These insects are indigenous to our tropical climate and thrive in the Mangroves that line beaches. They are so small they can fit through the screening on the unit's balcony. If you find yourself bitten by no-see-ums, although pesky, their bites go away in a few days. Treat with Calomine lotion to relive the itching sensation. Use repellant with DEET or Skin So Soft to deter no-see-ums from landing on your skin. How should you treat sunburn? It is highly recommended to wear sun block at all times due to the sun's constant presence in our area. If you find yourself with a sunburn while visiting with us the best treatment is aloe after sun treatment. To prevent sunburn, wear a hat with a wide brim, keep your skin protected by wearing long sleeves, and apply sun block liberally and consistently. If you are going to receive mail when staying at Sanibel Harbour Tower? What do you require to book a condo? Please go to our Terms & Conditions tab and reference Payment Terms. Can I use the Sanibel Harbour Marriott Resort & Spa Amenities? The Sanibel Harbour Marriott Resort & Spa offers 5 dining venues open to the public which includes a Brunch and Dinner Cruise. The Spa is available by appointment. The Fitness Center, Tennis, and use of the Pools and Lounge Chairs are available for Marriott guests' and those individuals staying at the Sanibel Harbour Tower who purchase a Guest Pass from the Marriott. Please go to Marriott Membership tab for more details and terms. No - Pets are not permitted as set forth by the Condominium Association. No - There is no parking charge associated with our Sanibel Harbour condos. Two spaces are allotted per condominium. Covered Parking is exclusive to condominium owners. If fishing on property at Sanibel Harbour Resort or the Punta Rassa Community, you do not need a fishing license. If fishing off property, you are required to purchase a fishing license through the Florida Fish and Wildlife Conservation Commission as a visitor.